 Rat anti Mouse IgG Heavy Chain antibody cocktail has been shown to be specific for the gamma heavy chain of mouse immunoglobulin by immunoblotting techniques. It recognizes IgG2a and 2b strongly and IgG1 and IgG3 more weakly. Purified IgG from BALB/c mice. Spleen cells from immunised LOU/c rats were fused with cells of the IR983F rat myeloma cell line. Bazin, H. (1982) Production of rat monoclonal antibodies with the LOU rat non secreting IR983F myeloma cell line. Prot. Biol. Fluids. Peters Ed: 29th Colloquim (1981). Pergamon Press, Oxford and N.Y., pp 615-618.